PERADENIYA: The colonial type building on which Peradeniya Resthouse stands began 110 years ago as the residence of British Governor Mr. Anderson. 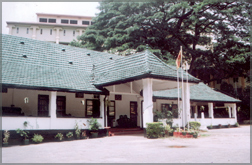 In 1948, the building was taken over by the Kandy Municipality and converted to a resthouse. In 1996, Peradeniya Resthouse saw a new lease of life when the versatile hotelier, Upul Jayaratne took over the resthouse, which saw a marked improvement in service and food. Peradeniya Resthouse has 12 guest rooms, including four A/C rooms. The present Manager of the Peradeniya Resthouse, Suraj Deen, who counts over 25 years experience in the hospitality industry, treats all guests with a personal touch and ensures that all visitors spend a memorable holiday during their stay. Peradeniya Resthouse stands at a scenic location, overlooking Sri Lanka's most popular Peradeniya Botanical gardens. Therefore it has become an ideal spot for family outings and company picnics, due to its romantic setting and cool climate. The restaurant at the resthouse, with beautiful interior decor, can accommodate over 100 guests. It offers delicious Western, Eastern, Chinese and spicy Sri Lanka cuisine prepared by the experienced Chef Rasika Kumara and his team. The Sri Lankan rice and curry is popular, not only among locals, but foreign guests. The Avanhala at the entrance to the Resthouse, also run by the Peradeniya Resthouse, is very popular among visitors to the Peradeniya Botanical Gardens. The Avanhala has a catering service and provides delicious take-aways. NEW EXPERIENCE: The "Elephant Corridor" hotel, Sigiriya has introduced special packages for Honeymooners from this month. A special Romantic-Hide-away package has been created to let the Honeymooners indulge themselves in Spa treatments, candle lit dinner in the romantic garden under the stars, a walk to count butterflies and see the wildlife. The Romantic Suite has been especially designed to provide the newly wed couple with an experience to last a lifetime. The indoor plunge pool too is another attraction while the romantic four-poster has been commented on so positively. Another special feature is that a customer could pay for a Deluxe Suite and get upgraded to a Romantic Suite with admirable compliments. The "Elephant Corridor" offers privacy and relaxation, while immersing oneself in the tranquil beauty of the surroundings and the breathtaking view of the lake and the Kandalama Hills. "Elephant Corridor", Sri Lanka's first purpose-built, luxury lifestyle, designer hotel, is set in a jungle plain, of 200 acres, in the vicinity of the fifth century Sigiriya Rock Fortress, also named the 8th Wonder of the World. Water bodies, wildlife sanctuaries and the ruins of ancient cities surround it. The hotel offers a choice of 21 luxurious suites, all having large dining, living, sleeping and bathing areas, with private plunge pools, offering uninterrupted views of the jungle plain and beyond. All suites have handmade furniture, four-poster beds, a bathtub and a separate shower, airconditioning, television, DVD player, sound system, cordless phone and minibar, as well as an artist easel with painting materials and binoculars. Day beds on a private terrace, in a private garden with a plunge pool, are also to be enjoyed by the discerning traveler. The Presidential Villa consists of 4 bedrooms, 2 dining and sitting rooms for 8 guests, and 2 large plunge pools with a bridge connecting both Villas. The six star hotel also offers an Ayurvedic and Wellness Spa and the small fitness room with steam bath and sauna. Bird watching, elephant rides, horse riding and bicycles are available within the premises while an archery range, cricket practice net and a pool table are some of the other attractions.